Encountering new things is important through a dog’s life, but probably never more important than between 8 and 16 weeks of age. 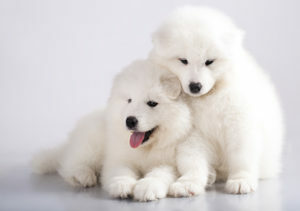 During this time, puppies mature quickly and learn to be confident. Puppies who don’t get sufficient socialization during this time might be fearful of strangers and anything new for the rest of their lives. It is important not to expose a puppy to potentially unvaccinated dogs – or places unvaccinated dogs might have been – before they’ve had all their shots and built resistance to diseases. Ask your veterinarian for advice. But, there are many other things you can do. For instance, invite different people to your home, so puppy doesn’t just encounter the same persons over and over. Bring your puppy to a friend’s or neighbor’s home to expose them to new environments, new people, children, and friendly vaccinated dogs. You can also enlist the help of strangers. Have treats ready and ask the mail carrier or a delivery person to give one to the pup. This tender age is perfect for teaching your puppy to sit when meeting new people. Every encounter is an opportunity to learn good manners – and to learn that strangers bring treats and joy. It’s also a great idea to enroll your puppy in a training class. It’s something to do together, an opportunity to learn together, meet other dogs and pet parents, and expose puppy to new pleasant experiences.